Firstly, we are crazy-excited to announce (and not to mention show off our new and improved poster) that this years Ellis Beach Regatta will be hosing the NQ Sabot and BIC Junior Traveller Series! A massive thanks goes out to Scott Davis for his efforts on this one, “On Ya, Scotty!”. Our amazing behind-the-scenes team have also published our Notice of Race for you all to get your heads around before the big event; please have a read through. Also attached is a copy of the Entry Form for you to print and fill out, however copies will be available at the event. 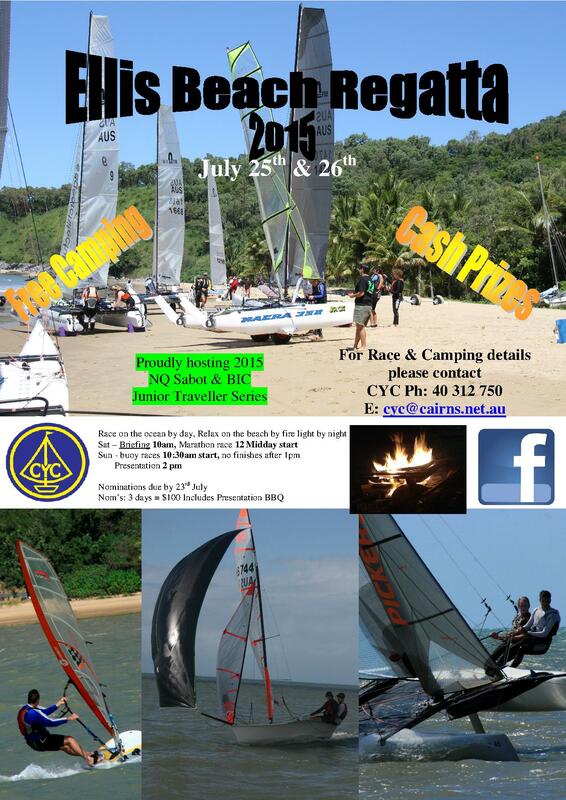 Come one, Come all to the annual Ellis Beach Regatta, 2015! Preparations have begun for this years event which will be held over the weekend of July 25th and 26th, and will include a long distance marathon race and short course buoy racing. We are hoping for a large fleet of Pacers, Lasers, Nacra 350’s and F18’s, and misc. beach boats. For those without their own boat, we will have boat hire options available for the clubs boats. But as always, first in – first served. Please contact the club to lodge expressions of interest. For the family, friends, and all those who don’t quite have the same salt-water addiction as the Ellis guys, we hope you will come out for the cold drinks, BBQ meals, and lively atmosphere. Watch this space for further details of the event! CYC- Ellis Beach Fleet Captain.